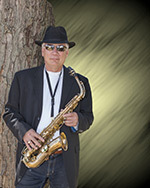 Allen Halstead is a local saxophonist with over 40 years of musical performance experience. Allen’s early years were spent playing in many types of projects which ranged from lounge trios to 10 piece rhythm bands. His musical styles include all genres of music: R&B, jazz standards, classic rock, smooth jazz and big band tunes. He has played all types of venues from small quiet lounges to wedding parties to the large stage. His mentors include such greats as John Coltrane, Stan Getz, Gato Barbieri, David Sanborn and Grover Washington. Allen is a 1981 graduate of Florida State University with a Masters of Music degree. While in college, he was able to experience playing with such well-known artists such as Stan Kenton, Ella Fitzgerald, and Lou Rawls. Allen plays tenor, alto and soprano saxophones using each horn to uniquely express what the music is trying to tell the audience. Currently he is still playing in all styles of music and recently had the fantastic experience of partnering with the man he calls his “musical brother”… None other than Mr. Azzaam Hameed. Allen believes that, while performing with Mr. Hameed, the whole is much greater than the sum of its parts. In addition to performing, he also assists the local school with their jazz ensemble and provides private lessons for those with interest.